Inder Loves Folk Art: Happy birthday Maggie! Featuring cupcakes and the doll bed I've been working on for a month! Happy birthday Maggie! Featuring cupcakes and the doll bed I've been working on for a month! This past Wednesday, July 9th, was Maggie's second birthday! I can't believe my little Margaret Joy is two years old now. Wasn't she just born like ... last week? But she's totally on board with this whole growing up thing and has learned the word "mine!" and the phrase "me do it!" My independent little girl seems to be getting more and more independent by the day. If I had to choose three words to describe Maggie: Easy-going (is that one word or two? ), independent, curious. She really is such a delight to all of us. We love you so much, Mags! Maggie's vocabulary is exploding right now. It's like she turned two, and she's like, "I'm a big girl and talk in sentences now." Yesterday, she politely asked Steve for "My burribo, pees?" We were like oh my gosh, here is your bean burrito!!!?!!! Officially the cutest toddler phrase of all time, right? Since Joe didn't speak in sentences until he was three (and boy did we enjoy and revel in it when he did! 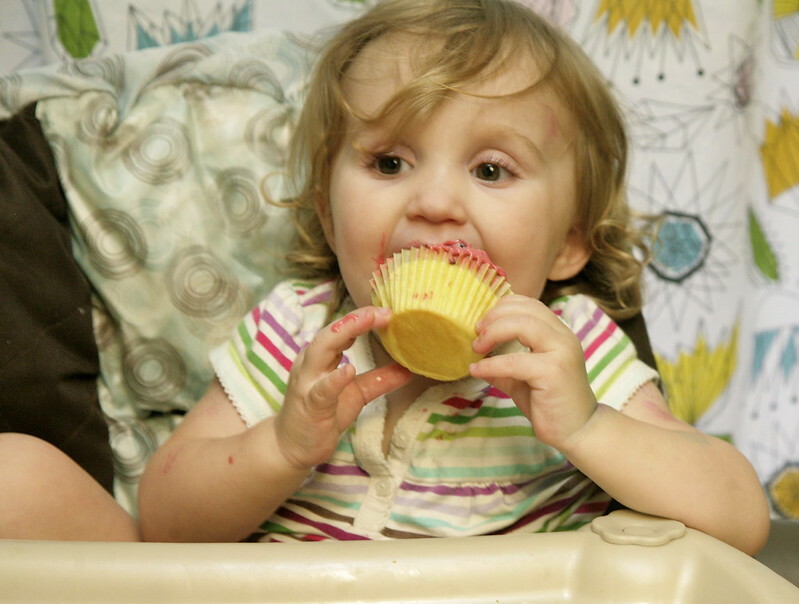 ), I have to say that watching Maggie hit these developmental milestones at such a young age really never gets old. We are daily amazed by her (actually quite average) speech development. It was a busy week, so we celebrated yesterday. I made lemon cupcakes with blackberry butter-cream frosting, using blackberries growing in our backyard. Anyway, cupcakes! Lemon cupcakes with blackberry frosting sounds pretty fancy, right? Well, here's how you do it. To your standard yellow cake batter, add one tablespoon lemon juice and a pinch zest. Then, to your standard vanilla buttercream frosting recipe, add a handful of fresh blackberries and another pinch lemon zest straight into the stand mixer and beat. Then, when your friends act impressed, pretend that it was very complicated and difficult. You're welcome! 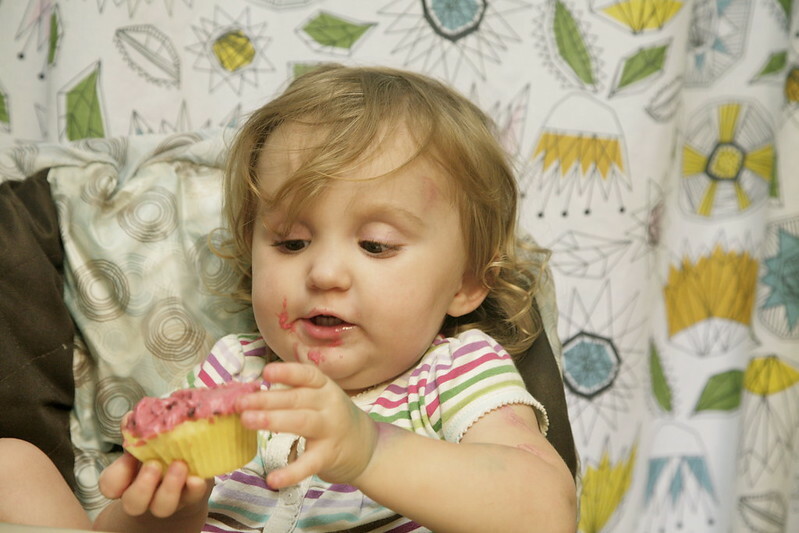 Maggie mostly just licked the frosting off of her cupcake. I don't blame her, it turned out really yummy, with a good amount of lemony-blackberry "tang"to offset the super sweet buttercream. Mmmmmm! Also, yeah, she likes to relax and put her feet up in her high chair. So now I finally get to share a project I have been working on for weeks now (you may have noticed I haven't posted for a while - it's because my main sewing project was top secret and neverending - I did share a peep here). 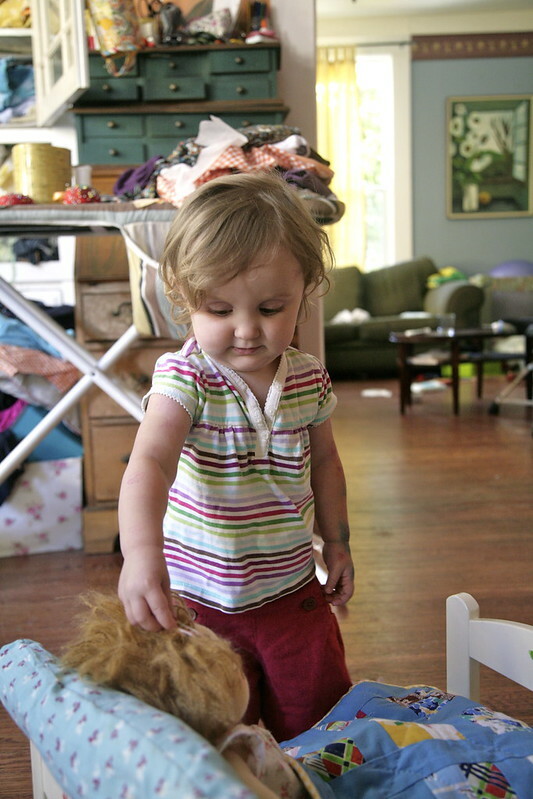 For Maggie's second birthday, I custom ordered a Waldorf-style doll from this wonderful Etsy seller, Eszter Budai Nagy. 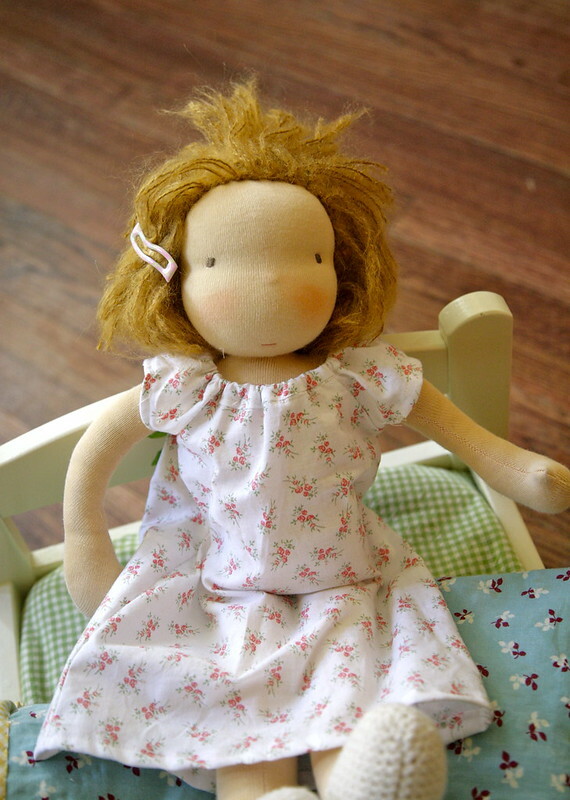 Eszter is based out of Hungary, and makes really beautiful dolls. She doesn't have any currently listed in her shop, but I fell in love with one her previous custom-orders, and asked her to make something similar for Maggie, but with Maggie-like hair. I am absolutely thrilled with the doll she made. She is made from soft jersey and stuffed with wool - it's hard to explain, but she just feels so warm and snuggly. And I love her sweet little expression (I am ignoring Steve's comments about dolls being "creepy"; lalalalalala, I can't hear you!). She is exactly what I asked for, and the craftmanship is wonderful. And Estzer was wonderful to work with and kept me posted on her progress throughout. It was my first experience custom-ordering something from an Etsy seller, and it felt really good to support another sewing/crafting mama! Once I got the doll, about a month ago, I set to work on a doll bed for her. 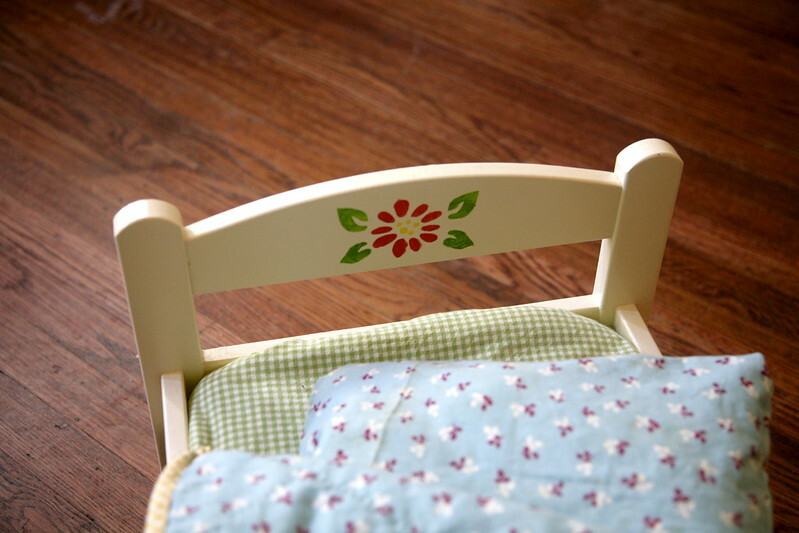 I bought a doll bed at Ikea and spray painted it with ivory. Well, actually, I spray painted it terribly and it bubbled and dripped all over and looked absolutely horrible, so then Steve rolled his eyes and stepped in and sanded it and repainted it properly for me, making the whole process look easy. Thanks, Steve! Then I stenciled flowers on the bed using acrylic paint and stencils I picked up at Michael's (unfortunately I don't see the ones I used online). Again, painting is clearly not my forte, but the stencils turned out rustic and cute! The sooner I quit painting and get back to working with fabric, the better, right? So I made bedding for the bed, including a little mattress and fitted sheet (totally insane, I know), a wool blanket, and a quilt. And a pillow with a separate pillow case. Then I made a nightie for dolly. With the end result that Dolly has a nicer bed and bedlinens than any of the real people in my household!! Priorities, right? Can you tell I was a doll-lover as a little girl? I got really into this project. At various points, I considered keeping the whole thing for myself. Hehe. 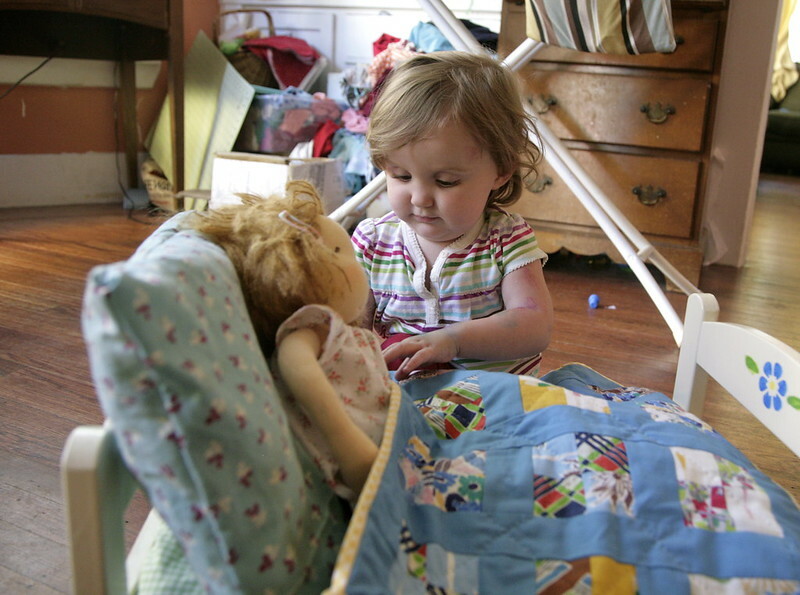 Since this is a sewing blog, I will share some of my work-process, but just so you know, there are cute pictures of Maggie playing with her new doll below, so feel free to scroll past the details to get to the cute baby girl pics. I used all stash fabrics and notions for this project. So while it was a very time-consuming project, it was very inexpensive at least. The Ikea doll bed cost $20, paint and supplies cost another $15 (not counting Steve's nice electric sander, haha! if you know how to spraypaint, you won't need that), and the fabrics, batting, and thread were all from my stash, and used up small pieces. This is the perfect project for rummaging through your supplies and using what you have on hand. The doll bed came with a simple plank "mattress" so I decided it needed a cushier pad on top of that. 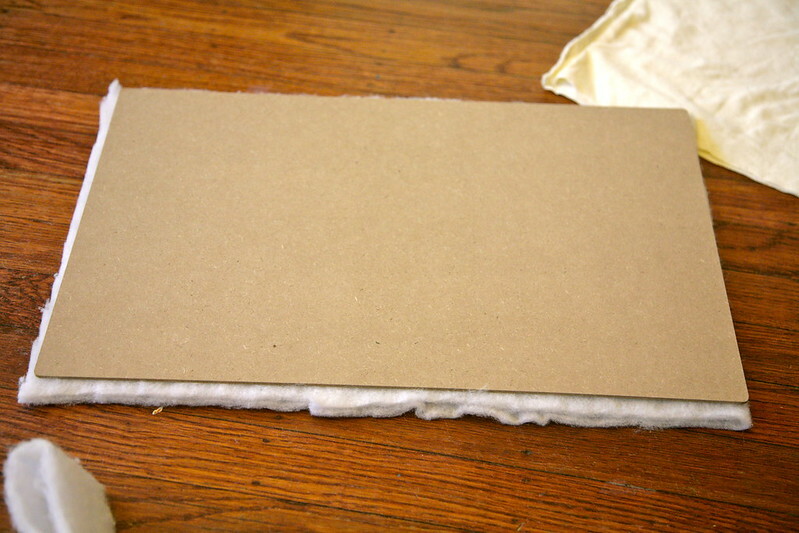 I used the little bed plank to measure and cut some cream flannel and two layers of high-loft poly batting to fit. 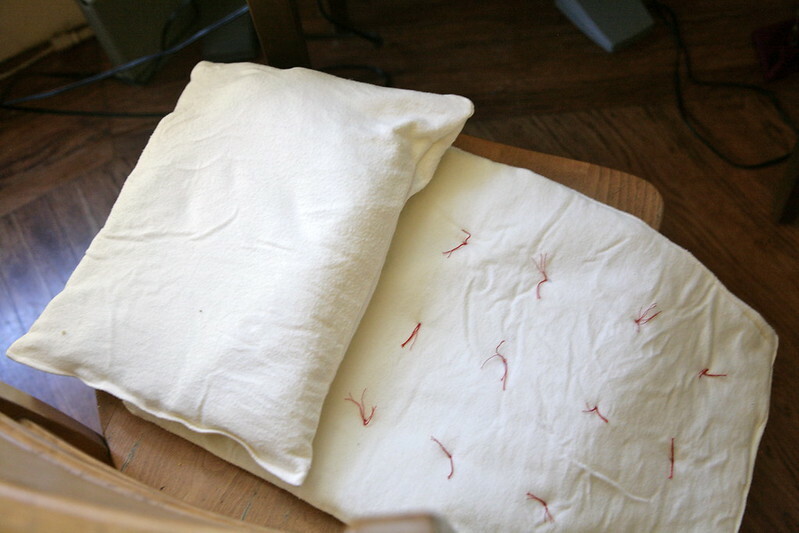 Then I sewed a little mattress/futon stuffed with batting and hand-tied it with red embroidery thread. I made a pillow from four layers of batting and flannel, which turned out to be a bit big and "out of scale" with the bed, but it's just for pretend after all. 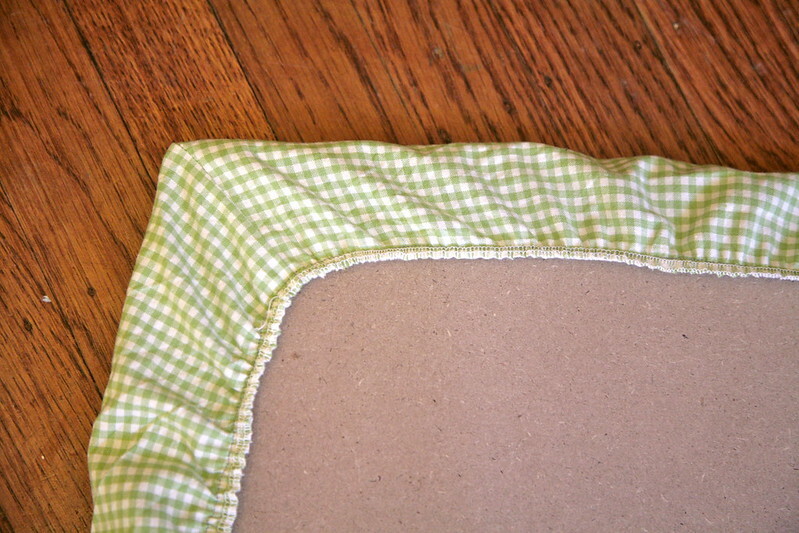 Then I made a little fitted sheet from sage-green gingham with box corners and a simple serged elastic edge (I stretched the elastic as I serged it along the edge of the sheet). 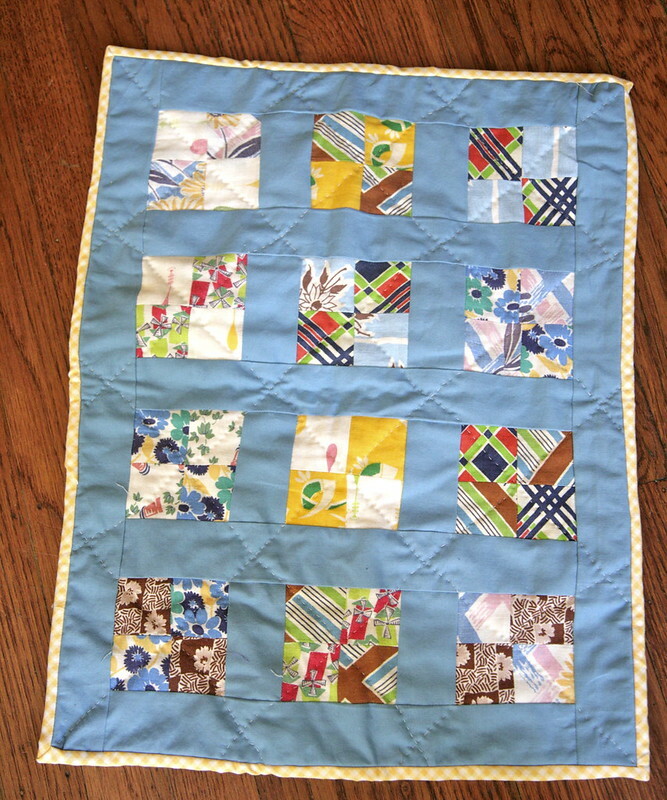 The quilt was a labor of love, using little vintage feedsack scraps given to me by a friend, sashed with a lovely blue. I sandwiched it with cotton batting and a piece of a thrifted gathered skirt I've had in my "refashion" pile for ages for the backing (I used the same fabric for the pillowcase, see the photo above). Then I hand-quilted it in simple diagonal lines and bound it in yellow gingham. I have to say, while this was not a quick project, it sure is faster than making a larger quilt and it's really fun to be able to use such small scraps! 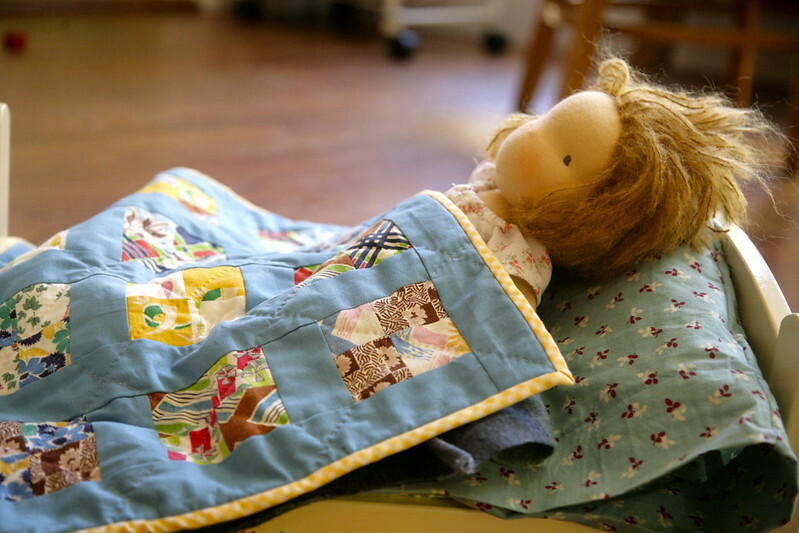 Doll quilts are really fun! Finally, I whipped up a little raglan nightgown for Dolly, using the clothes she came in to eyeball a pattern (you can see the adorable clothes that Ezster made for her here). I also made a little wool blanket - I just cut a piece of wool from my stash, ran it through the washing machine and dryer to shrink it, and turned down and sewed the edges. 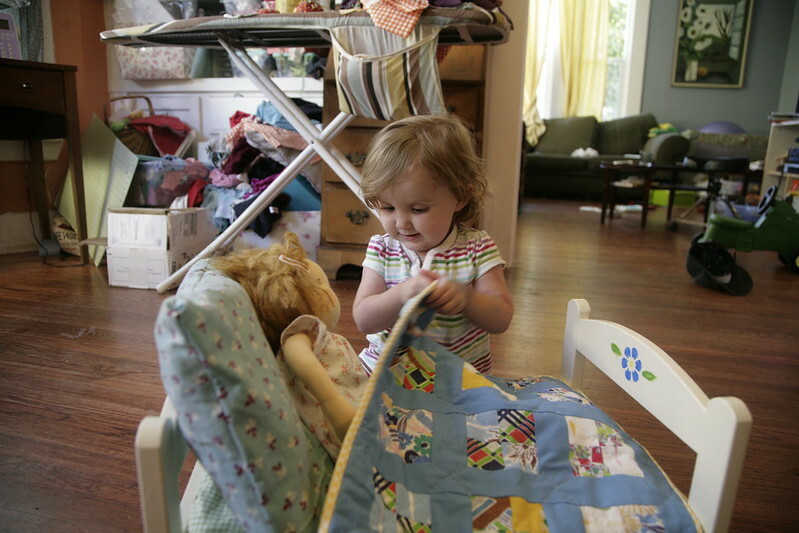 And here is what you have all been waiting for: Maggie seeing her new dolly and doll bed for the first time. Just try to resist this sweetness. On second thought, don't bother. You can't. 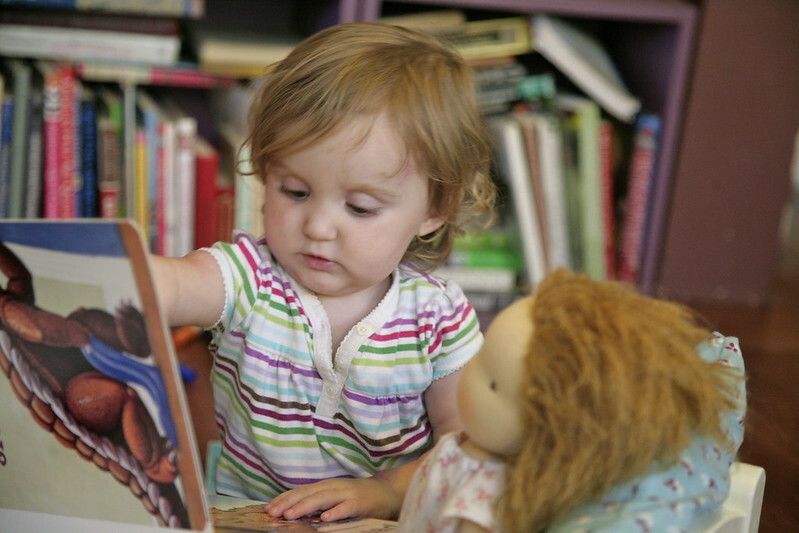 Yes, you saw that right: She's reading a book to her doll. I told you it was pointless to resist! This was such an enjoyable project for me, and I had a ridiculous amount of fun making little doll things, and spent a lot of time remembering how my grandmother made things for my dolls when I was a little girl. I don't think doll-lovers ever completely outgrow the love of dolls and miniature everything (well, if I haven't outgrown it by age 37, I think it's safe to say I never will!). 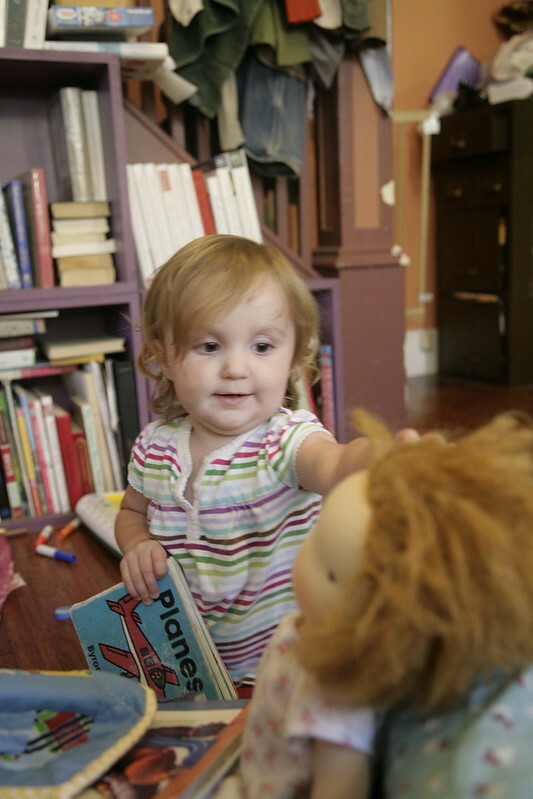 But of course the best part is seeing Maggie approach her new dolly friend so gently and sweetly. And read her a book!!! You're right, it's impossible to resist the cuteness! 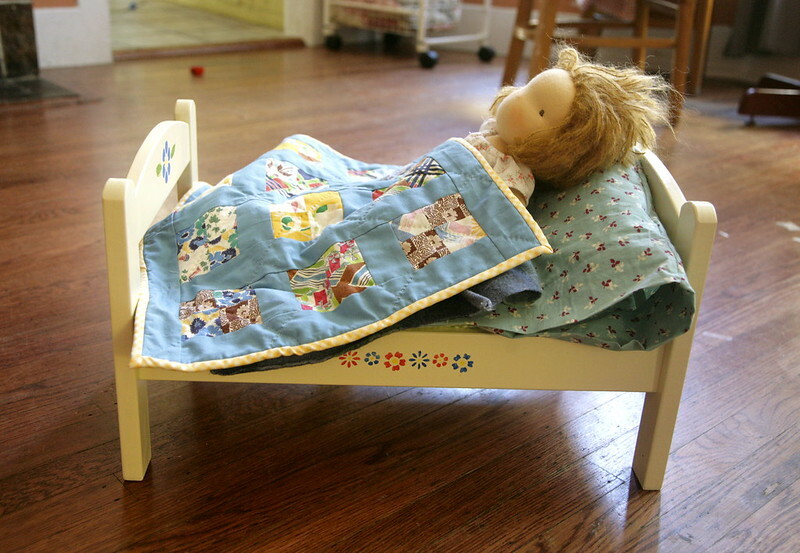 I love the quilt and doll bed. You did a great job. Oh, two! Happiest of birthdays Miss Maggie! I think you have possibly exceeded your blog-post cute-limit. Will have to check with the authorities. Happy birthday Maggie! love it - it is all too cute. thank you my daughter will also be turning two this year and you have inspired me to get creative on the dolly front. i too was a huge doll fan and loved spending hours playing with them. Inder, maybe it's because I'm almost 38 weeks pregnant but I was practically welling up this entire post! It just really touched me! I love all of the ways you made M's birthday so special. The dolly bed is magnificent! I'd imagine you'd pay several hundred dollars for something similar from a natural toys store. I absolutely love Maggie's reaction to the dolly, too! It's all so perfect! My heart was ready to explode, too! Happy Birthday! Where did the time go baby girl?!? Her dolly is so cute and you did such a great job on the bedding and those cupcakes! I have to try them out! You had me from the start with your description of blackberries (so many childhood camping memories, those thorns!) and then it just got better. fantastic sewing and she is really, too cute. 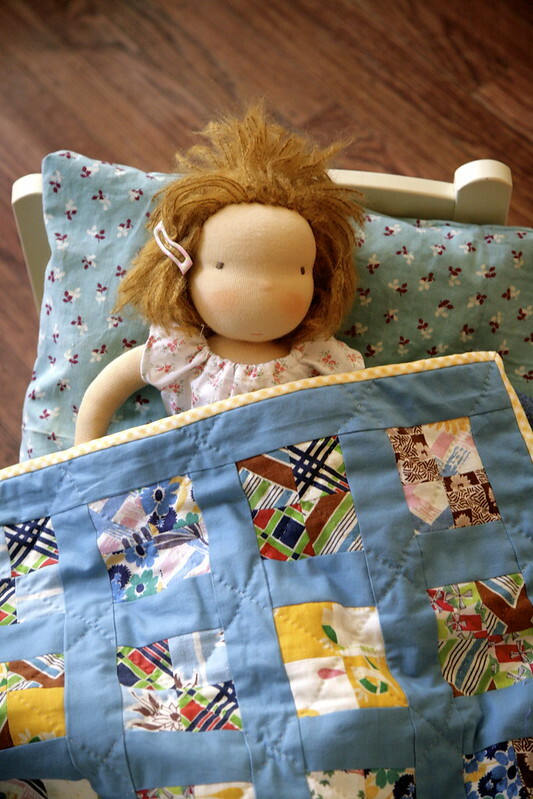 Handquilting is lovely isn't it, and having only done one small doll quilt myself, I think they are the perfect project! That is one fantastic - and very thoughful - present! I love how you incorporated so much of you in it! Happy birthday, Maggie! This post is almost painfully cute. Burritos will never be anything but burribos for me ever again. And Joe -- what a sweetie! 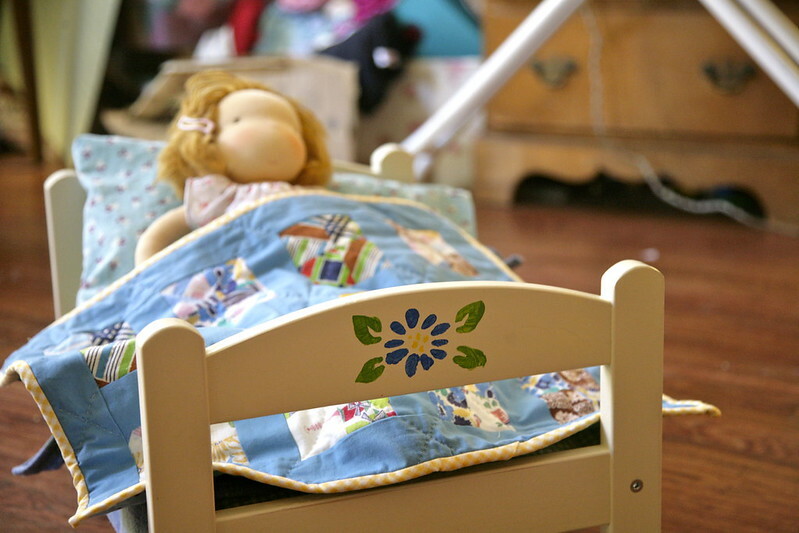 The doll bed is absolutely exquisite -- well done!! So much cuteness here! You know, we have the same IKEA doll bed and when we got it two years ago I had great plans to make it some new bedding. And never to around to it. Oh well, yours is absolutely lovely! I am so happy I just found your blog. I love all this doll stuff you made!!!! The bed and bedding are so perfect. I love how they all look together. Your daughter is so cute playing with it. I have a three year old and when she plays dolls or with her tea set I just can't stand how sweet it is. 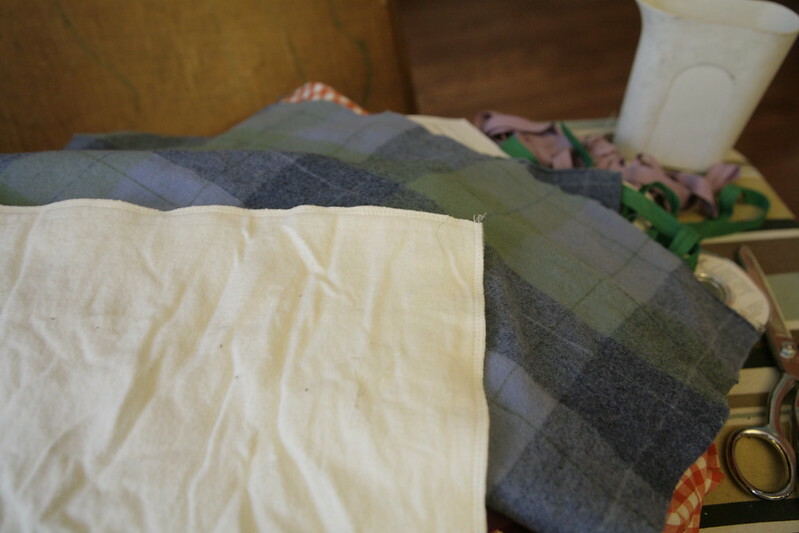 I am making a doll outfit right now.